14ymedio, ORLANDO PALMA, Havana, 5 January 2015 — A Cuban television special this Sunday entitled “They Call Me Cuba” addressed issues of “cultural consumption in the 21st century,” with special emphasis on the well-known weekly packet of audio-visual material that is distributed illegally throughout the country. Some specialists answered questions ranging from musical tastes to the need to impose cultural policy on the private and tourist sectors. Just inside the homes, out of the control of the cultural supervisors and far from the censorship scissors, the packet has life. The numbers of audience members lost by official television is never made public, but, in view of the worry that its officials demonstrate, the phenomenon of the packet-ization of Cuban society must be reaching significant levels. In interviews conducted on the street, several people referred to their experiences as consumers of the packet. The favorable opinions mentioned that an advantage of this kind of cultural consumption is that it gives better information about what is happening “in the international arena.” Reported among the factors leading to the increased alternative distribution of audio-visual content was the deterioration of the movie houses that domestically offer a poor substitute for public spaces. The view that this compendium of audio-visual content is only “soap operas and reality shows” was challenged by several survey respondents who mentioned the didactic and instructive character of some materials like documentaries made by The Discovery Channel, as well as courses in make-up, gastronomy and handicrafts that are also included in the so-called combo. Nevertheless, the formula for improving the official programming bill faces the difficulty of few resources for legally acquiring foreign content or advancing national production. 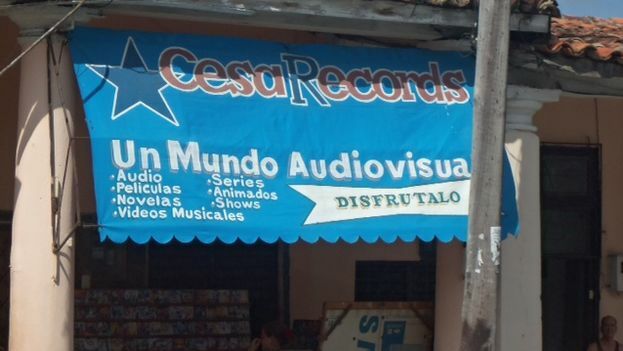 Cuban television has underperformed in terms of quality, dynamism and thematic updates. An industry that was a pioneer in Latin America and the world has been suffering the fact that series and soap operas produced in Mexico, Colombia and Brazil captivate the public. The problem is rooted in issues that range from undercutting wages of actors and technical personnel to censorship that for decades caused bland, complacent scripts closer to sketches for a school morning assembly than to material to captivate and entertain. But the packet has come first to that competition with the advantage of being customizable, free from censorship, adjustable to all tastes and considered by the majority of Cubans as something outside of state control.